Riverview Suites is a pet-friendly, 80 room, smoke-free hotel. The rooms feature balconies, cable TV with free HBO, kitchenettes, and free wireless internet access. There is also a swimming pool, complimentary airport shuttle and a free continental breakfast. 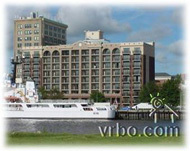 The hotel is located in Wilmington’s historic district and is just a few minutes from the Cotton Exchange and Chandler’s Wharf. There is a coffee shop, the River Club Lounge and Spencer’s Restaurant.